If there is something I’ve enjoyed doing a lot of lately, it is organizing. It seems as though this is my year to get down with my bad self in the organizing department. The kids may think I’m crazy, but it really is a good thing to get organized. One area that I got tired of looking at in my house is my desk. It’s so full of clutter and disarray. So, you can guess that this week, this is what I tackled. Note: I’ve linked to some helpful resources on Amazon. The links to the products are affiliate links and I can earn a small commission if you choose to buy anything, but the price for you will not be effected. Ditch the paper stacks: On my desk, you will find tons of paper stacks. Sometimes they aren’t even stacks – they’re just lots and lots of papers that never got thrown away. Between the kids, mail, and my paperwork, you really never know what you’ll find. For this reason alone, I’ve been trying to make everything as paperless as I can. Makes more sense and it’s less work for me in the long run. Make your desk functional: Sometimes, I put way too much stuff on my desk and it really makes no sense at all. This week I focused on making my desk more functional. I removed anything that I was no longer using and I put things away that don’t go on the top of my desk. You would be surprised at the amount of stuff I found on my desk that didn’t even belong there. Ditch the junk drawer: I probably have a junk drawer in every room of my home. I ditched my desk junk drawer this week. There were so many random items in there. It’s really a good feeling to get rid of the items we don’t use and obviously don’t need. Plus, the sooner I get rid of those items, the less likely they will end up back on my desk. Invest in a few desktop organizers: One of my favorite things about an organized desk it having room for real desktop organizers. You can find these super cheap almost anywhere you go, or you can just use organizers you have on hand. If you are feeling feisty, you can even use drawer organizers to keep everything in its place. Assign a place for everything: One of my biggest challenges has always been not knowing where to put all of the “things” I collect through the course of a day-week-month. When I don’t know where to put something, it usually ends up in a messy pile on my desk or in the junk drawer where it’s forgotten. My greatest long-term organizing successes come when I create a place to put each item. Note: that “place” is more than often NOT on or in my desk! 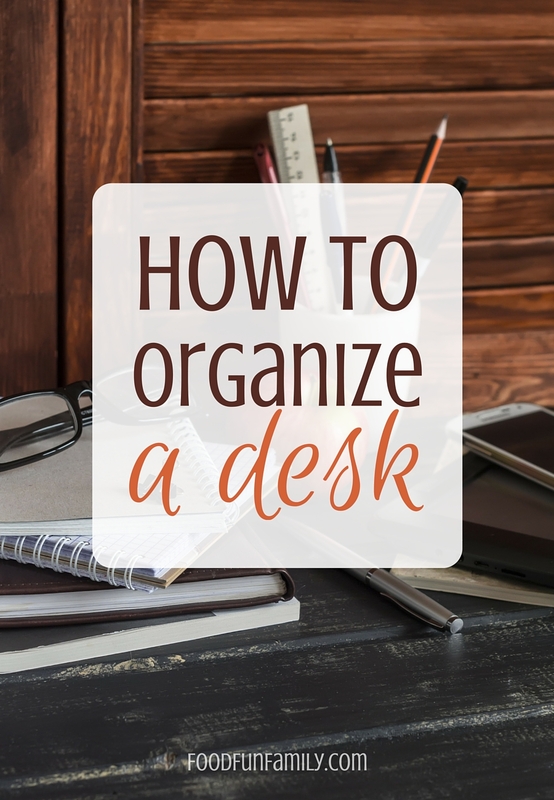 While organizing my home hasn’t always been the easiest task, I realized that I just need to take it one step at a time…and this week it was to organize the desk. Gone are the days where I let “things” and “stuff” overwhelm me. Are you ready to jump on the organizational train? I can not stand a messy desk! I have to have it organized and have it clean and functional. It is so important to have a nice working space while at the computer. Thanks for your tips. I really needed this because my desk at work is a hot mess!